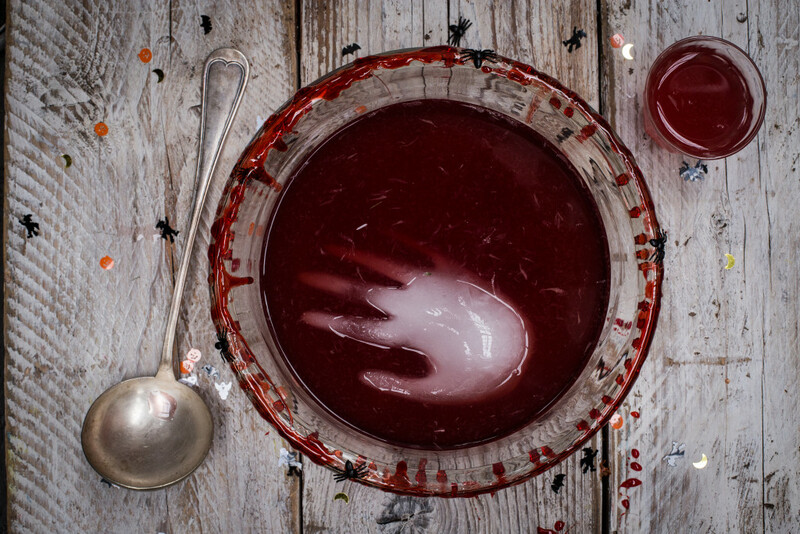 Halloween fruit punch in a bloody bowl, and creepy Apple Bites…these are perfect for your next Halloween party, especially if you are trying to avoid adding to the sugar craze! 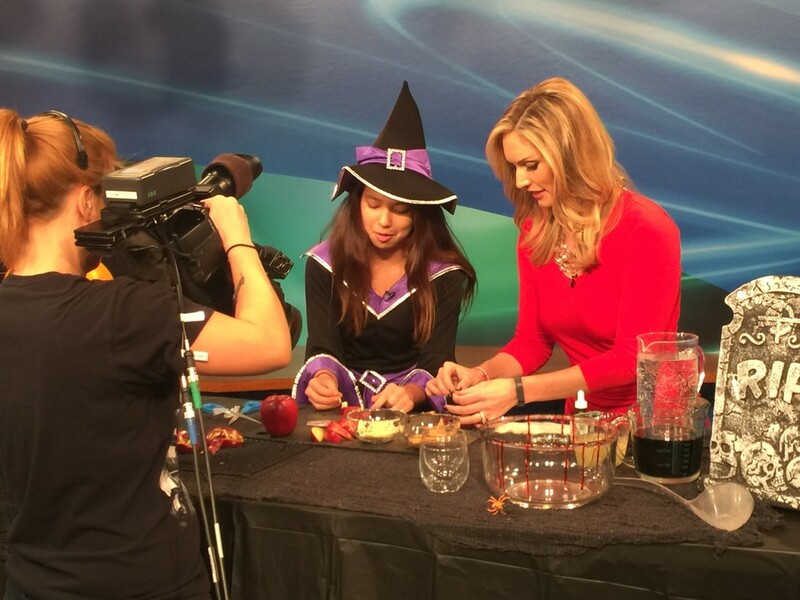 I shared these recipes with viewers of Q13 FOX News today, and it was a blast! If possible, chill your punch bowl and all ingredients ahead of time so your limeade is cold when you make it. That way, your hand ice cube will stay longer. The amount of ingredients you need will depend on the size of your bowl. The ingredient list above is for a quart, so multiply that as needed. The night before (or earlier), make your ice hand by filling your glove with water, tying it off with a rubber band, and placing it in the freezer. For best results, let it rest over a bowl so it is a bit cupped - it will look more natural that way. To decorate your punch bowl, take some golden syrup (corn syrup will also work), and add red food coloring until you get the bloody color you want. Make sure your bowl is placed on a surface that doesn't stain. Carefully drip the red syrup around the edge of your bowl, letting some drip down the outer edge. Place some plastic spiders on the syrup - it's perfect glue! Refrigerate the bowl until ready to use, and also to harden the syrup a bit. When you are ready to serve your limeade, combine all the ingredients in the bowl. Retrieve your ice hand from the freezer, cut the glove using a paring knife, and carefully peel off the glove. Gently place the hand in the limeade, and serve. Happy Halloween! These are super fun to make, and really good to eat! Cut about a 2.5-inch strip of the fruit roll-up, then cut one end round so it's shaped like a tongue. Drape it over one apple slice. Stab slivered almonds into the apple to create teeth. 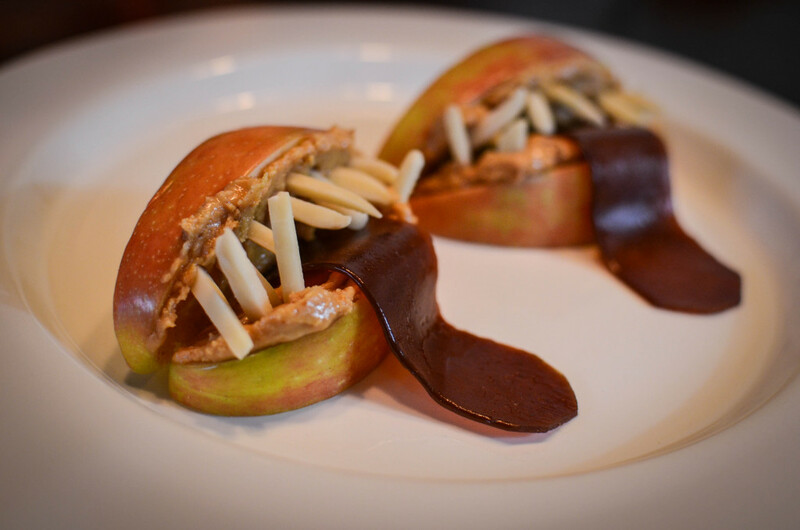 Drape the apple slice without the fruit roll-up over the other to create a Creepy Apple Bite.